This is a more common condition in Chihuahuas and it is important to find out if your puppy’s line is free of this condition before purchasing. 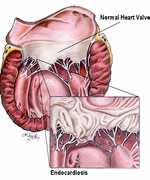 A disturbance in the blood flow is the cause of heart murmurs. There are five grades of heart murmurs and are graded on how audible the murmur is. Heart murmurs are an indicator that there may be a disease or condition of the heart that will need to be monitored and treated. If a disease is evident, the dog is placed on special instructions for exercise and diet and medication may be prescribed.